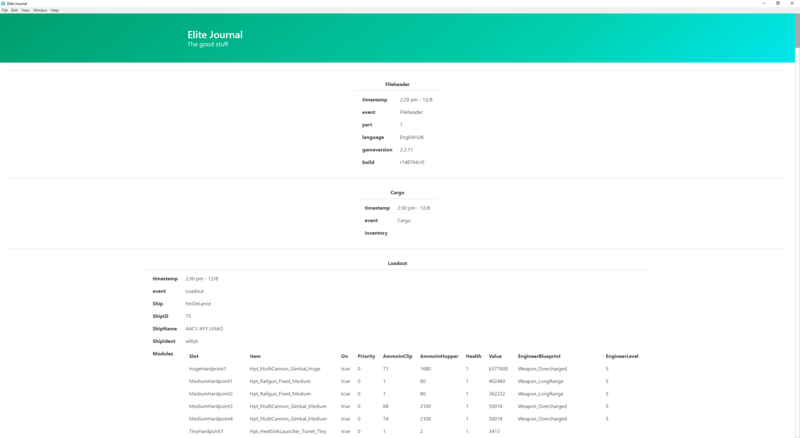 Browse the Elite: Dangerous journal easily. Parsing the Elite: Dangerous journal and putting it into a cool format. Whats it actually do then? Basically it allows the average joe to have a look at the journal log for Elite: Dangerous in a nice easy to read format. Download a setup .exe from the releases page, and then run it. It will automagically update when you run the application from now on! Builds the app for Windows x64, using electron-builder. Builds the app and distributable setup exe for Windows x64, using electron-builder. Looking at journal logs in a nice format. Drag and drop logs to load them. Built with web technologies and Node.JS. Keyboard shortcuts for various actions. Easy on basically everything to do with resources.